Seagate Highland in Highland Beach, Florida is a luxury waterfront condominium community offering residents a life in paradise. With four 10-story buildings comprised of 316 condos, Seagate Highland condos is a premiere senior community requiring residents to be exclusively 55 years of age and older. 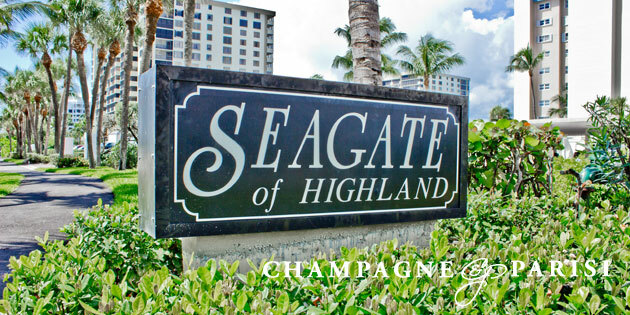 Seagate Highland is located in the Southern part of Palm Beach County between the Intracoastal Waterway and Atlantic Ocean. As it faces the Intracoastal, exquisite views of the waterway can be seen from the condos. The condos for sale in Seagate Highland offer residents with many 5-star amenities. From lounging on the sundeck by two extravagant swimming pools to working up a sweat in the state-of-the-art fitness center, residents of Seagate Highland have a lot to choose from. Taking a stroll on the private beach is just steps away for residents of this Highland Beach community, or they can enjoy a clubhouse fit for entertaining. The Seagate Highland condo building in Highland Beach is located just between two major cities in South Florida: Delray Beach and Boca Raton. Residents are a short drive away from the Downtown Delray Beach Atlantic Ave where dozens of high-end boutiques and night-time entertainment is featured. Residents can also drive to the Town Center Mall at Boca Raton as well as enjoy Boca’s famed Mizner Park. Seagate Highland condos are also situated between two international airports and are within close distance to all major highways. Living at Seagate Highland condos is the perfect choice for seniors looking to spend their days in paradise.